As part of our ten year celebrations, SSCo opened Kaavish at Liverpool Capstone Theatre last Saturday, and it went down a storm! 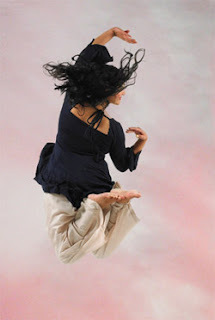 Now we now look forward to performing in our home town and second home the Birmingham mac this Saturday 24th Nov, where in fact Sonia Sabri started her journey as a dancer at the age of eight. Kaavish highlights some of SSCo's best known performances from the past ten years, including an extract choreographed by Shobana Jeyasingh. The second half is an explosive collaboration of kathak and bharatanatyam with Sonia and Ash Mukherjee, an energetic duet that will leave you breathless! As always, SSCo is pleased to present dynamic live music by Ustad Sarvar Sabri through out the show. We are also, proud to platform local talent on Friday 23rd, as SSCo students of Classical Indian music and Kathak will take over the mac stage for the night. Another night full of surprises! Do keep an eye out at the mac for other SSCo events, including dance film by Toby Norman- Wright, Paintings by Sarvesh Saini and random performances.